What It's Really Like To 'Walk' In Space The International Space Station conducted a spacewalk this week to mark 15 years in space. Three people who've walked in space share their miraculous — and miserable — experiences. Extravehicular crewmember 2 (EV2) Terry Virts is reflected in the helmet visor of EV1 Barry Wilmore during Extravehicular Activity 29 (EVA 29). Earth is in the background. Astronauts Scott Kelly and Kjell Lindgren left the International Space Station on Friday for their second spacewalk in less than two weeks. Their assignment was to configure a vent door on the port side ammonia tank. That meant they were outside the space station, tied only with a tether, floating in outer space. The flights that you've had are fine, but the only flight you really care about is your next flight. Most of your ideas about space might come from movies — or maybe your third grade trip to the planetarium. Today, you can log onto NASA's website and watch live feeds from the International Space Station for a real-life space adventure. Perhaps even more life-like, let's hear about this very particular space experience from three astronauts themselves. This week on For the Record: Walking in space. Click the audio link on this page to hear the full conversations. When Scott Kelly and Kjell Lindgren were out on their first spacewalk on October 28, their only connection to Earth was Tracy Dyson, the NASA astronaut in Houston giving them directions on the other end of the line. 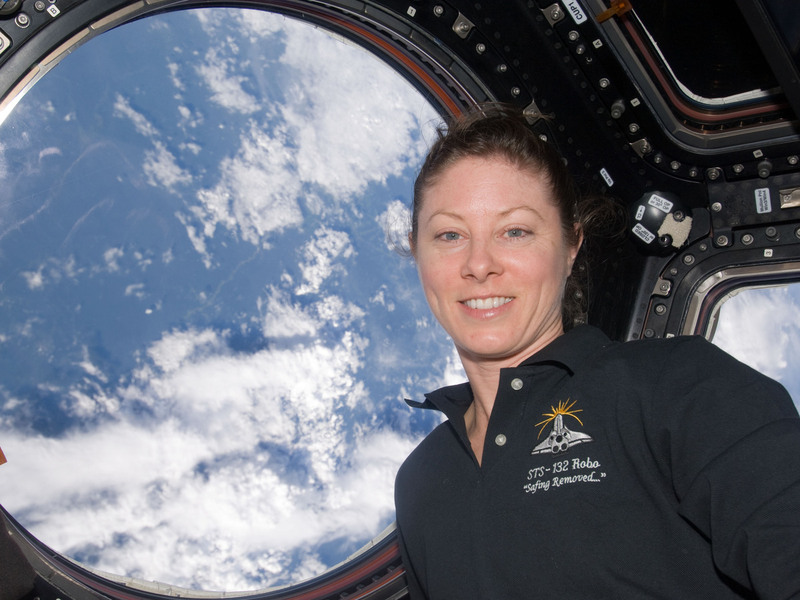 View of Tracy Caldwell Dyson, Expedition 23 Flight Engineer (FE), posing at window in the Cupola Module. Photo was taken during Expedition 23 / STS-132 Joint Operations. "I am totally in their ear, I mean to an annoying degree probably," Dyson says. She's watching a feed of Cmdr. Kelly's spacewalk. "It's nice when you have someone that's done it before, because then they can relay experiences or at least speak to them in a manner that they know that they would want to be spoken to," she says. And she knows what it's like because she's done three spacewalks herself. She's a member of a small group of people who have had the experience of, not just going up into space, but actually floating around in it. Before you get to float around in the atmosphere, there's a lot of training. Much of it happens in a huge swimming pool at Houston's Johnson Space Center. The pool is the closest you can come to simulating the experience, but Dyson when you are in space you quickly realize it's a little bit different. "There's no diver floating around to keep you safe, and you just see this planet beneath your feet going 17,500 mph, and you and the other person in the puffy white suit are the only two out there in the vacuum of space; you tend to hang on a little tighter," she says. And that puffy white suit is really heavy. "The spacesuit itself weighs about 400 pounds on Earth" says astronaut Terry Virts. "And so moving around in the spacesuit just to move your arm requires physical exertion." Dyson remembers her first spacewalk clearly. "There's nothing," she says. "No structure in your view and you just see the Earth and I'm up there, and even though I've got probably 50 handrails all around me that I can hang onto and I've got a hook, a big hook from my waist to structure so I know I'm not going anywhere, it was still one of those breathtaking moments where it was like, 'Whoa.' "
These moments of reflection are rare. 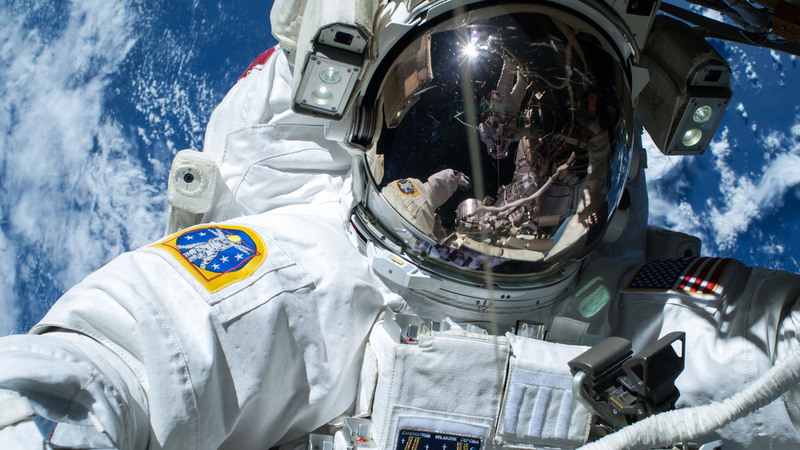 Spacewalks can take more than seven hours and they demand focused concentration. Just ask Virts. Virts, who is also a U.S. Air Force colonel, has been on two space flights and completed three spacewalks. 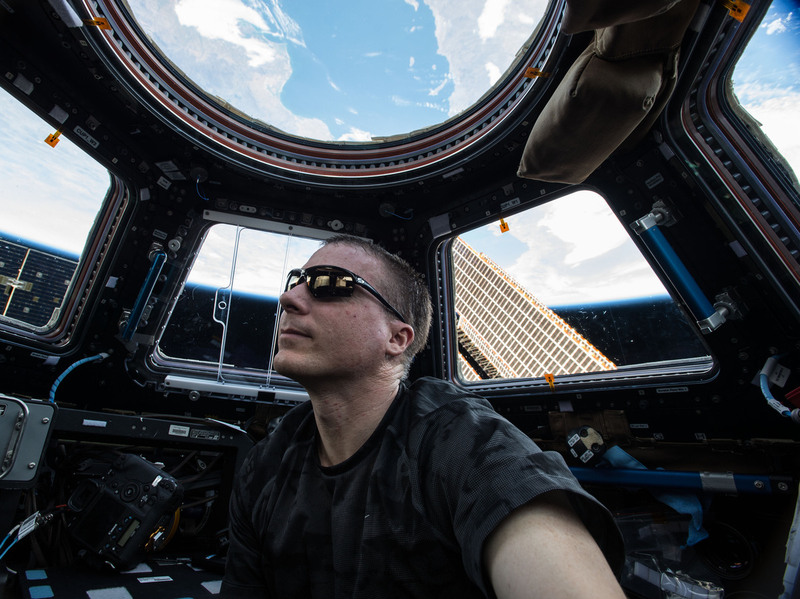 Self portrait of Expedition 43 commander Terry Virts in the Cupola module. "I've flown jet fighters, and been a test pilot." But, he says, "There's nothing like spacewalking." He says, "99.5 percent of your time, my time on my spacewalks, I can say, was completely focused on what was going on. I felt not rushed but pressed every second that I was outside. Like there was no time to stop and look around, there's no time to take pictures. There's no time to do anything other than you've got another task going on because you don't want to spend extra time outside." That's because things can go wrong. Two years ago, things did go very wrong for Italian astronaut Luca Parmitano. Early on in his second spacewalk, he felt water on the back of his head. "And I knew that something was not right," he says. There was a leak in his helmet. He didn't want to tell ground control in Houston, fearing they might cancel his spacewalk. But he told them anyway. 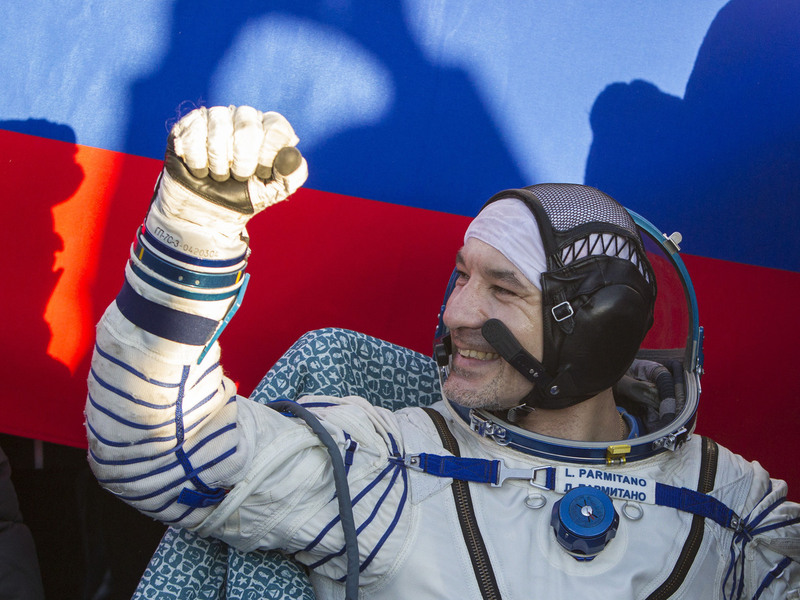 Italian astronaut Luca Parmitano gestures after landing in a remote area near the town of Zhezkazgan in central Kazakhstan on November 11, 2013. "Are you sweating, you working hard?" asked the Houston responder. "I am sweating," Parmitano said. "But it feels like a lot of water." "That is when things went really south," he recalls. "The sun went down. And when the sun goes down on orbit, it is not like one of those beautiful sunsets. It lasts only a few seconds. One second you have light. And the next ... It is complete utter blackness." A liter and a half of water had flooded into his helmet while he was upside down. It came from the cooling system inside his suit. In space, water forms a goopy gel that sticks to your skin. Pretty quickly, that water disabled Parmitano's communication system. "I couldn't hear anything anymore. I couldn't see anything anymore," he says. "And I couldn't breathe through my nose. Because my nose was filled up with water." He could still breathe through his mouth but he couldn't see. Slowly, he felt his way along the surface of the space station in the direction of the airlock. When he finally made it back, his partner on that spacewalk, Chris Cassidy, radioed to Houston that Parmitano was fine — miserable, but fine. Even after that, Parmitano says, "I wanted to go out the next day." No matter the risk, it's hard for astronauts to call it quits. Tracy Dyson hopes she'll get the chance to go again. "But we have so few flight opportunities and we have new people that haven't flown once even and so there's need to give everybody a chance to get up there and get that experience," she says. Since NASA ended its shuttle program in 2011, astronauts now ride on small spacecraft operated by other countries. There just aren't as many opportunities as there used to be. "The flights that you've had are fine," Terry Virts says, "but the only flight you really care about is your next flight."